To emphasize that the new highrise being built at 1500 Robson St. will be pet friendly, two dogs — Hazel and Trink — made an appearance at the Feb. 20 ground breaking. They're pictured with (left to right) Mayor Kennedy Stewart, as well as Ralf Dost, Steve Marino and Jeff Fleming from GWL Realty Advisors. It’s unusual to see a pair of dogs — in this case Hazel and Trink — at a press conference packed with developers, real estate types and politicians. But not when you’re trying to underscore the fact a new development will be pet friendly in a city where it's notoriously difficult to find an apartment that accepts animals. That was the case Feb. 20 at a ground breaking for a 21-storey market rental building going up at 1500 Robson St. in Vancouver’s West End. The pooches got a front-row seat to hear speakers, including Mayor Kennedy Stewart, praise the tower, which will produce 128 rental units, a third of which (42 units) will be two- and three-bedroom family-sized apartments ranging from 753 to 978 square feet. 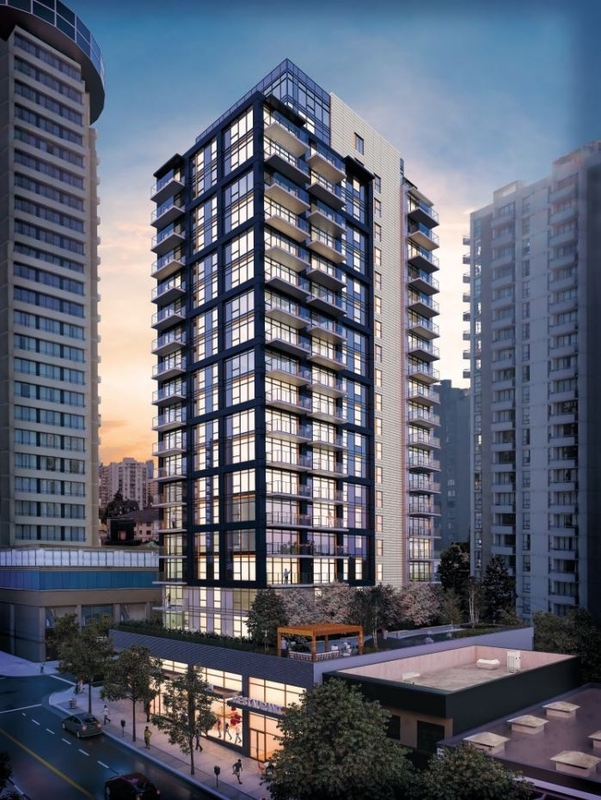 It’s one of the first rental towers to be built along Robson in decades, “in a city that’s in need of rental housing and in a neighbourhood of luxury condominiums,” according to GWL Realty, and the first rental project on Robson to be approved under the city’s West End Community Plan, which was adopted in 2014. Ralf Dost, president of GWL Realty Advisors’ real estate portfolio, said it’s important to create more purpose-built rental apartments given Vancouver’s tight vacancy rate and the fact much of the existing stock is dated and in need of upgrades. “We also know how challenging it is to make financial sense of multi-residential developments, especially in this West End neighbourhood, so all of these factors make the launch of this project today that much more gratifying,” he said. Stewart agreed that increasing the supply of secured market rental apartments “is more important than ever” when more than 50 per cent of residents are renters and vacancy rates are at an all-time low. “It’s the kind of ground-breaking we all like to come to because it is helping us with our key problem of [increasing] market rentals. We need all kinds of rentals in the city — we need affordable rentals, but market rentals are also a key part of fixing our supply problem,” he said, while adding that residents have also been pushing for the construction of units big enough for families. 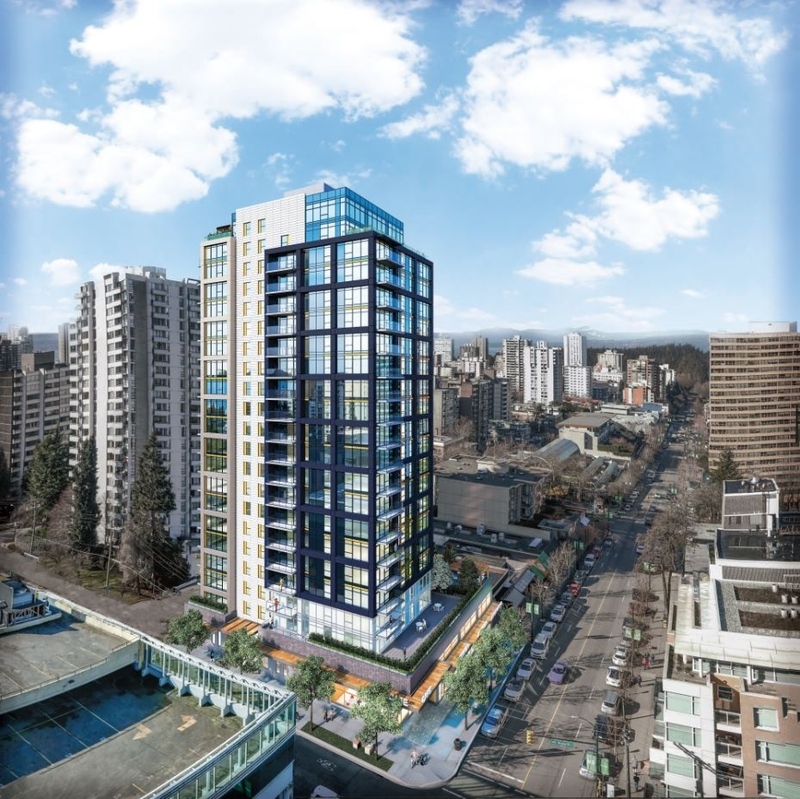 The highrise, located at the corner of Robson and Nicola streets, is expected to be completed in 2021. It will feature “substantial” bicycle storage and maintenance facilities, as well as indoor and outdoor amenities, including fitness, yoga and lounge rooms, a rooftop patio and a common area for tenants on the penthouse floor. It’s replacing a low-rise commercial building that used to face Robson, which featured a few residential units, as well as a residential building behind it that was mostly rented to international students. The 12 tenants who lived in the two buildings were relocated elsewhere with some assistance. GWL Realty Advisors provided tenants with the equivalent of two or more months’ rent based on length of tenancy, and support with moving expenses. It’s too early to say what rents will be in the new building, but they will be at market rates. The average rent for a bachelor suite in the West End was $1,254 in 2018, according to CMHC data, while a one-bedroom was $1,566, a two-bedroom was $2,330 and a three-bedroom was $3,368 — tough rates for the average Vancouverite to afford. Stewart told the Courier the city is focused on ensuring both market and affordable rental units are created. Toronto’s downtown relief subway line—should the political will needed to build it ever materialize—could partly fund itself, to say nothing of the skyrocketing valuations that will result. According to Andy Manahan, executive director of the Residential and Civil Construction Alliance of Ontario, the municipal government can use zoning as a bargaining chip with developers to pay for the proposed network expansion by negotiating additional storeys. Many existing TTC subway stations were created as architectural monuments rather than into the sides of buildings, which is what would adequately succour density. And if the mere rumour of below-grade infrastructure is enough to cause property values to rise, imagine what a unit 25 storeys above a subway platform would be worth. “Typically, once an announcement is made about where the line will go, property values do increase, so the trick is how we ensure we can capture some of that increase in value,” continued Manahan. However, more is at stake than optimizing real estate values. Toronto’s current subway network is overcapacity and its platforms dangerously brim with people. Given how many skyscrapers will continue sprouting downtown, not to mention the already low office vacancy rate, Manahan warns that the network’s capacity troubles are worsening. The RCCAO has been an outspoken proponent of the downtown relief line, taking out full-page newspaper ads and even launching a Twitter campaign called #GimmeRelief. The earliest the downtown relief line could complete is 2031, however, there’s no official plan to build it. In fact, it’s as much of a pipe dream today as it was a decade ago—and making matters more frustrating for commuters, the Scarborough subway line has been given priority. Backwards thinking, says Manahan, because sequencing is important and dictates building the network outward rather than inward, where support infrastructure is presently non-existent. But he takes solace in Ontario’s political parties acknowledgment that the downtown relief line needs to be built.